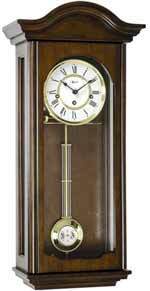 The Key Wind Clock collection of offers various styles of mechanical "Key-Wound" driven movements. Westminster chime movements with chime lever to silence the clock on demand. for evening hours. Durable bronze bushings in some of the finest, German made mechanical movements. These clocks are mechanically powered and need to be wound once per week. These styles are available to complete, match any decor or just the right size for your room. 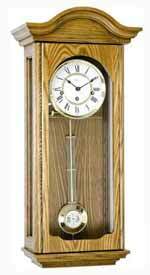 If you wish not to have to wind your clock weekly, you should consider the Traditional Quartz Wall Clocks Here. The Howard Miller 613-229 Alcott offers an impressive pediment featuring a sculptured cove and enlarged dentil molding. An off-white Roman numeral dial features a solid brass bezel and decorative accents between the numerals. Hinged front door with latch. A polished and raised brass pendulum with grid and polished chime rods add a distinctive touch to the interior. Finished in Cherry Bordeaux on select hardwoods and veneers. German made Keinenger Key-wound, quarter hour Westminster chime movement with hour count. Chime silence lever and durable bronze bushings. One Year warranty and Free Shipping. Size: H. 23-3/4" W. 14-3/4" D. 7-1/4"
A gently arched bonnet. Ivory dial features polished brass bezel, Arabic numerals and decorative hands. Polished brass pendulum features a decorative grid. Finished in Oak Yorkshire on select hardwoods and veneers. Key wound, Westminster chime movement with chime silence option and durable bronze bushings. Size: H. 25-3/4" W. 13" D. 6-1/4"
Features a swan neck pediment and turned finial. Ivory dial features polished brass bezel, Roman numerals and decorative hands. Polished brass pendulum features a decorative grid. Finished in Windsor Cherry on select hardwoods and veneers. Weekly German Keinenger Key wound, Westminster chime movement with chime silence option and durable bronze bushings. 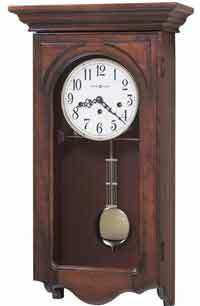 Size: H. 27-3/4" W. 13" D. 6-1/4"
This wall clock offers exquisite details from top to bottom, and features a distressed Hampton Cherry finish. Carved acanthus leaf molding wraps around the pediment, while olive ash burl overlays frame the dial. The polished brass pendulum is accented by a decorative burl back panel and a beat plate. Framed by a polished brass bezel, the off-white dial features a decorative center medallion and Roman numerals. Lightly distressed finish in Hampton Cherry on select hardwoods and veneers. Key-wound, Westminster chime movement with chime silence option and durable bronze bushings. 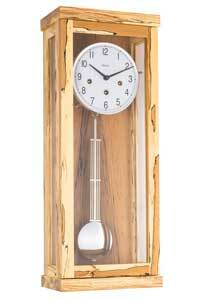 Size: H. 35-3/4" W. 14-3/4" D. 6-3/4"
This 78th Anniversary wall clock offers both substance and charm. The flat top pediment is accented with olive ash burl corner overlays. A sculpted bottom on the hinged door completes the appealing design. An off-white dial features black Arabic numerals, black serpentine hour and minute hands. A polished brass finished pendulum and bezel provide the perfect accents to the warm wood case. Finished in Windsor Cherry on select hardwoods and veneers. Key-wound, Westminster chime movement with chime silence option and durable bronze bushings. Size: H. 24-1/4" W. 13" D. 6-1/2"
An individually carved, scalloped shell on the pediment is designed similar to a John Goddard original. The highly polished Viennese dial is overlaid with individual convex chapter rings. The front door offers beveled glass. A polished brass lyre pendulum swings by a beat plate. Finished in Vintage Mahogany. Key-wound movement with chime silence option and durable bronze bushings made in Germany. Triple chime movement plays Westminster, Whittington or St. Michaels chime melodies by moving a sliding selector lever. Size: H. 33-1/2" W. 14-3/4" D. 7-1/2"
This reproduction wall clock features a barometer, thermometer, hygrometer, and a seconds track. Lower front-opening door allows easy access to the lower dial. Finished in Windsor Cherry on select hardwoods and veneers. Key-wound movement counts the hour and plays 1/4 hour Westminster count. Clock has lever switch to shut chimes off. Key-wound movement has true quarter hour chimes. Size: H. 35-1/2" W. 15-1/4" D. 6-1/2"
This wall clock features a distinctive dentil molding on the profiled pediment with maple and ebony hand-rubbed marquetry overlays at each corner. The white dial offers black Roman numerals and serpentine hour and minute hands. A polished brass lyre pendulum appears behind the locking door. Finished in Windsor Cherry on select hardwoods and veneers. Locking door. Key-wound movement with chime silence option and durable bronze bushings made in Germany. Triple chime movement plays Westminster, Whittington or St. Michaels chime melodies by moving a sliding selector lever. Size: H. 33-1/2" W. 14-1/2" D. 6-3/4"
This wall clock is lightly distressed. Accenting the pediment and base are four carved overlays and a dentil molding above the dial. The unique dial features a soft, aged design with an antiqued, brushed brass-finished bezel. Fluted columns frame the beveled glass front-opening door with an antiqued, brushed brass pendulum highlighted inside. Finished in New Haven on select hardwoods and veneers. Key wound, Westminster chime movement with chime silence option and durable bronze bushings. Size: H. 36-3/4" W. 16" D. 7-1/2"
A flared, molded bonnet and fully molded base. The off-white dial features Arabic numerals and floral-patterned corner accents. A spun brass pendulum bob appears behind the front-opening glass door which features a polished brass door pull. Finished in Oak Yorkshire on select hardwoods and veneers. German Key wound, Westminster chime movement with chime silence lever and durable bronze bushings. One year warranty and Free Shipping. Size: H. 24" W. 14-3/4" D. 7-1/4"
The most elaborate Limited Edition wall clock ever introduced. Finished in beautiful Windsor Cherry on select hardwoods and veneers, this wall clock is over 3-1/2 feet tall. Rare white ash burl overlays frame the beveled glass on the door. Beveled glass continues on the sides. The inscribed dial offers a pierced cast center and applied numerals. Newly designed pendulum. Decorative rope-styled molding appears on the front and sides of the base. A cable driven, triple chime movement offers automatic nighttime shut-off option. The Hermle Northfields Keywound Wall Clock is an elegant solid wood regulator in walnut finish with side glass panels. The cabinet is Made in Amherst, Virginia and has a trapezoidal shape where the back is slightly wider than the front door. The white metal dial features a brass bezel and black Roman numerals. 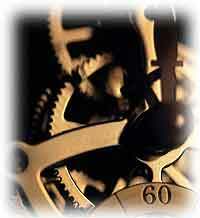 Key-wound movement features a traditional 4/4 Westminster chimes on each quarter hour, and also strikes the full hour. There is also a mechanical night shut-off lever. Exquisitely crafted English style Mahogany case with a book-matched Mahogany veneer across the front, opening door. The inside back of the clock is also crafted in two sections of book-matched mahogany. White enamel metal dial with contrasting black Roman numerals and filigree hands set behind a hinged front door. Solid-brass, German made Hermle 8-day movement with durable bronzed bushings and milled ratchet wheels for extra durability.. Movement plays Quarter Hour (4/4) Westminster melody followed by an hour count. Three Year Warranty and Free Shipping. 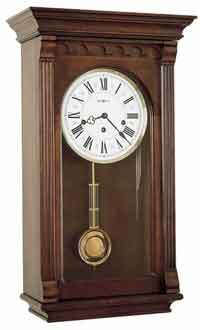 Size: Height 27 1/2", Width 10", Depth 5 3/4"
The Hermle 70989-T30341 Wanduhr Chiming Wall Clock has a Knotty Beech finish that gives this clock a lot of character. The finish on this clock make it so that no two are exactly alike. The contemporary case has a flat top and elegant straight lines. The silver bezel and pendulum bob truly accentuate the contemporary look. 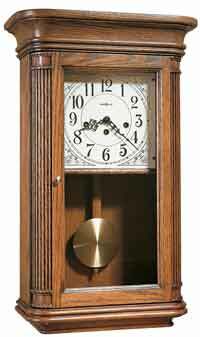 The key-wound quarter-hour Westminster chime movement has a night time shutoff lever and is made in Germany. Three year warranty and Free Shipping. The Hermle 70990-090341 Braxton Chiming Wall Clock is an eight day key-wound wall clock that is finished in light Maple with a contemporary style. The silver bezel and pendulum bob accentuate the elegant contemporary look. The white face has black Roman numerals and straight black hands. The Quarter-hour Westminster key-wound night time shutoff movement is made in Germany. Tuned acoustic chime rods are struck with brass hammers. Three year warranty and Free Shipping. This eight day keywound wall clock is finished in Oak with an arched bonnet top. Front hinged door opens from the left. Full length side window panels on both sides lets you see the movement inside the clock. Quarter hour Westminster movement is made in Germany. Three year warranty and Free Shipping. 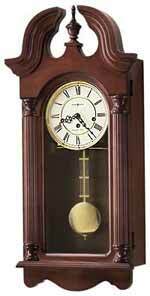 This eight day keywound wall clock is made of solid cherry with an arched bonnet top. Front hinged door opens from the left. Full length side window panels on both sides lets you see the movement inside the clock. Quarter hour Westminster movement is made in Germany. Three year warranty and Free Shipping. This eight day keywound wall clock is made of solid wood in a walnut finish with an arched bonnet top. Front hinged door opens from the left. Full length side window panels on both sides lets you see the movement inside the clock. Quarter hour Westminster movement is made in Germany. Three year warranty and Free Shipping. New - Hermle Hartford II keywound wall clock. Made in USA! Vienna styled regulator wall clock in a cherry finish on an all Solid Cherry case. Front opening glass door with side window panels. Reeded front door panels done in solid cherry. Chimes are spring powered and the time function is powered by the middle weight which is wound once per week. Hermle German weight driven movement plays 4/4 Westminster chimes. Chime off lever and automatic night shut-off lever. Size: 36" H. x 12 3/4" W. x 6 3/4" D.